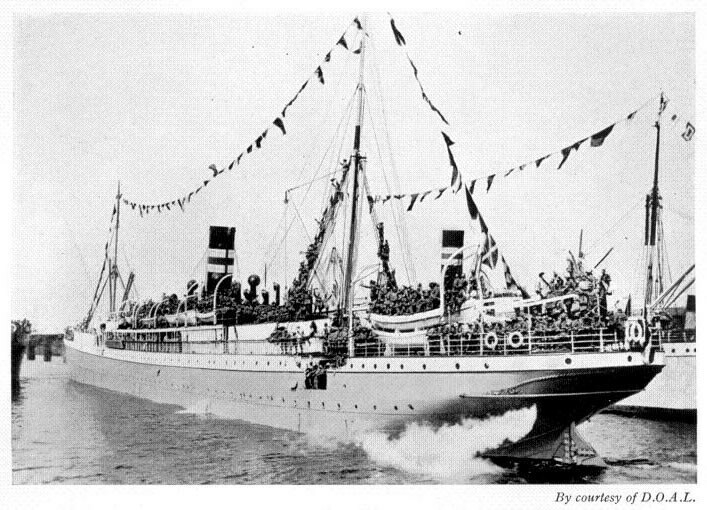 The Gertrud Woermann 11 leaving Hamburg with troops to quell the Herero War in 1904. 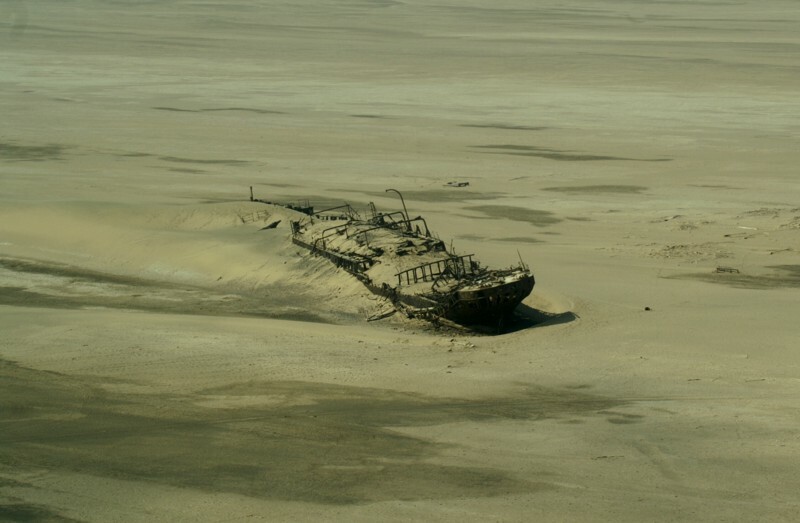 The Otavi shipwreck in Spencer Bay, Namibia (Skeleton Coast), which Ran aground in 1945. 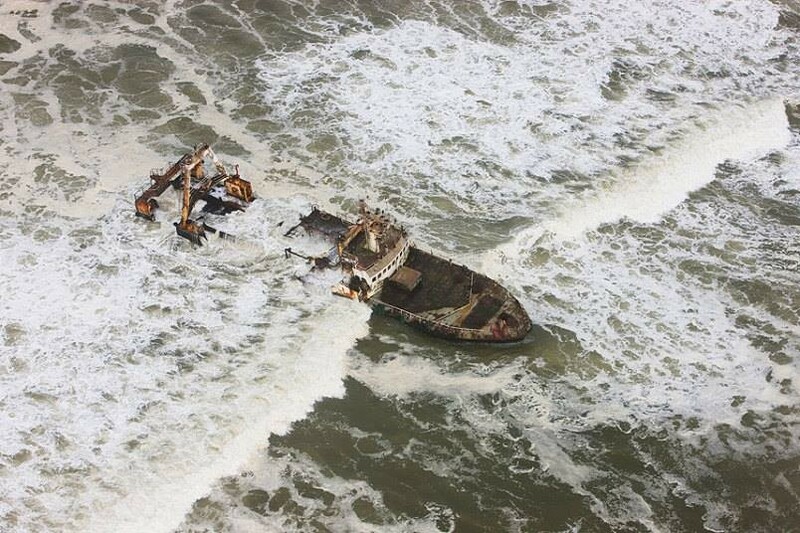 The Zeila stranded on 25 August 2008 just south of Henties Bay. Photo taken in 2014. The Chamarel on fire with the patrol boat Nataneul Maxwilili approaching. The Chamarel stranded whilst still smouldering. The Skeleton Coast is the northern part of the coast of Namibia, south of the Kunene River to the Swakop River. It is also often used to describe the entire Namib Desert coastline. 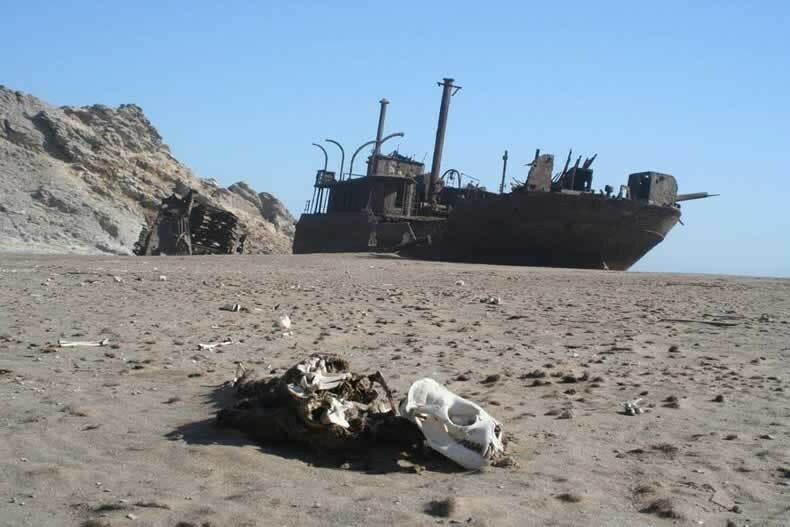 The Skeleton Coast is associated with shipwrecks, and stories of sailors walking through the desert in search of food and water. The name is derived from the bones that lined the beaches as a result of whaling operations and seal hunts. A few of the skeletons were human. The blinding fog typical of this coast results in ships running aground or wrecking on the off-shore rocks. 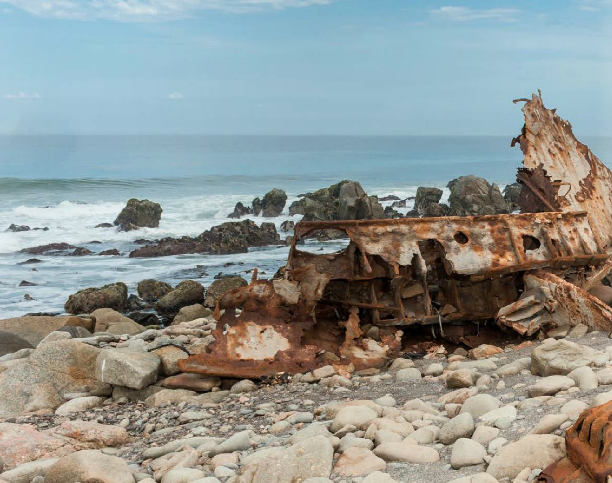 The coast is littered with scores of shipwrecks, some are barely recognizable, other are still in remarkably good condition. Below are the stories of some of these wrecks. 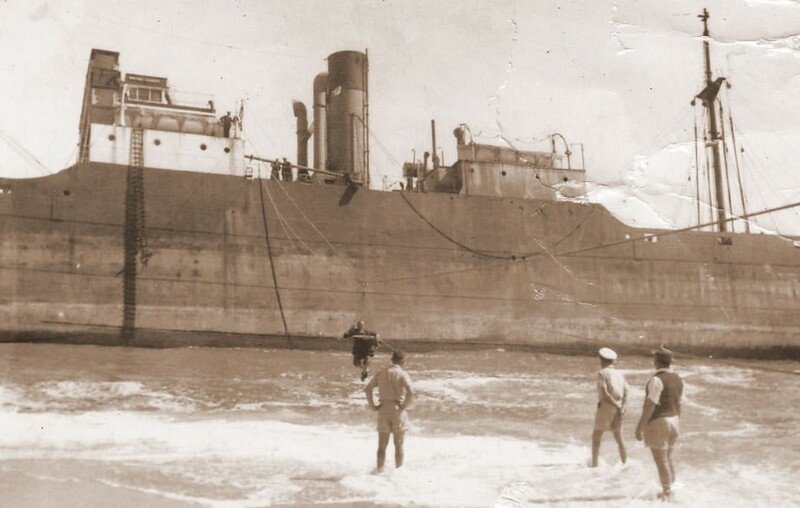 The Gertrud Woermann II, a passenger / cargo ship of the Woerman Line ran aground in thick fog on a reef thirty kilometres north of Swakopmund on 20 November 1904. She weighed 4603 tons and was built by Wigham Richardson at Newcastle. She carried 400 soldiers, horses, war material, mail and general cargo. 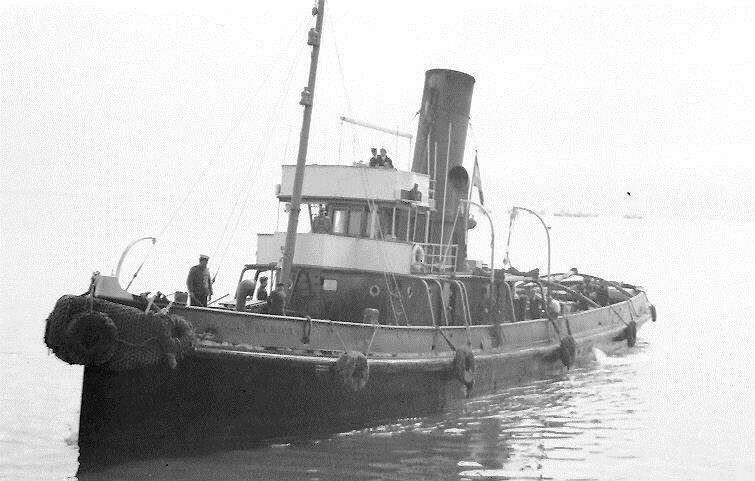 The gunboat Vineta, at that time on a visit at Swakopmund, assisted with the salvage operations. No lives were lost. The wreck was visible until 1912, when she disappeared under the water during a heavy storm. Today a beacon, the so-called Gertrud beacon, marks the spot where she has sunk. 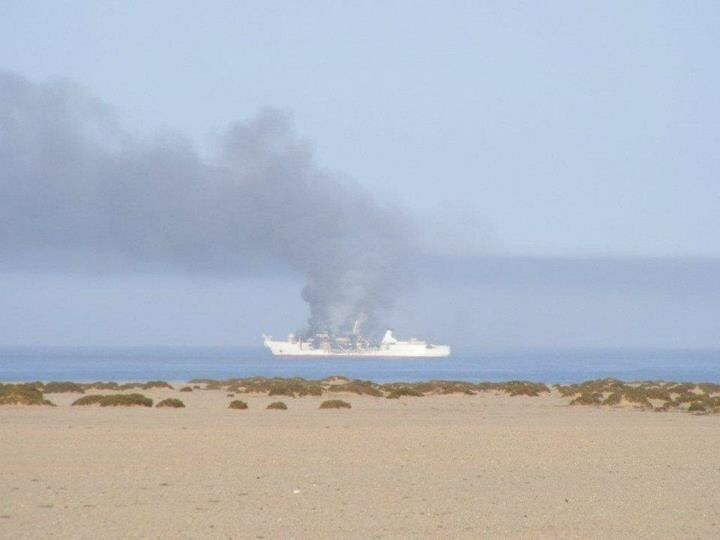 The Eduard Bohlen, a 2 272 ton German passenger / cargo ship of the Woerman Line, was en-route from Swakopmund to Table Bay. On 5 September 1909 the sea was covered in thick fog. The 95 meter ship lost its way and ran aground at Conception Bay. 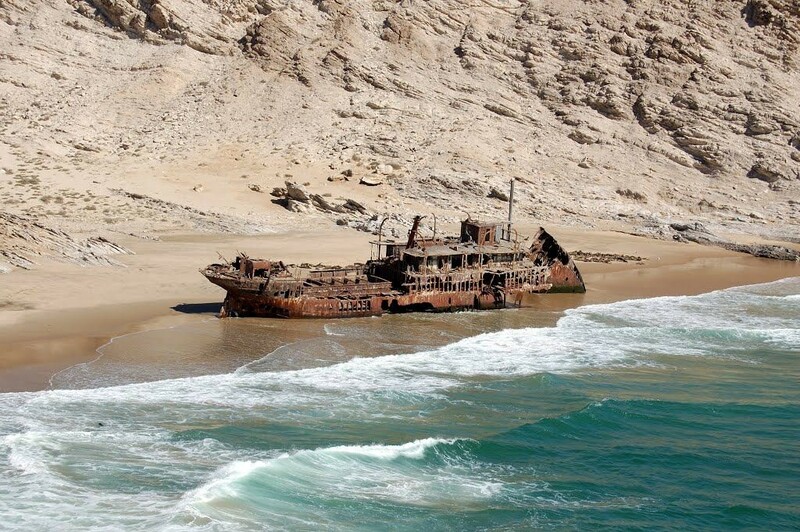 The wreck of the Eduard Bohlen is one of the most photographed shipwrecks in Namibia. It is 800 m inland and partially buried under the desert sand. Below is a photo of the Eduard Bohlen in Table Bay. 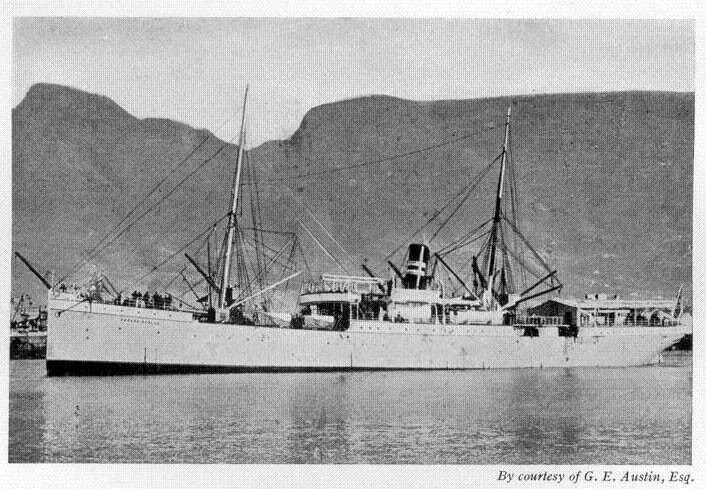 The Otavi was a steamer with a cargo of Guano. It ran aground in Spencer Bay, Namibia during 1945. 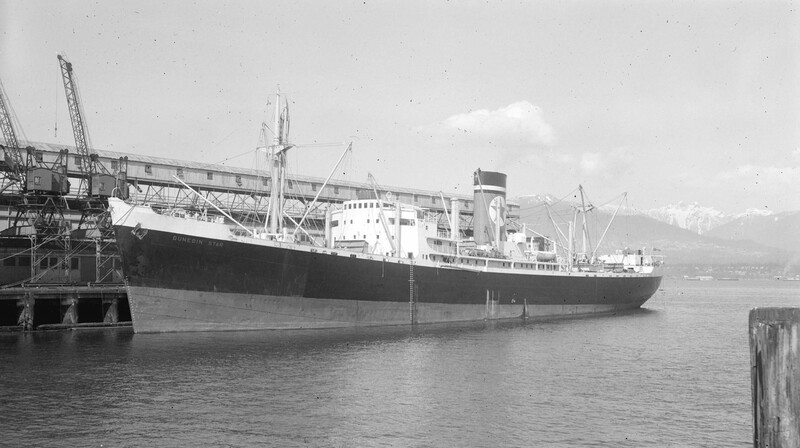 The Dunedin Star was a British refrigerated cargo passenger liner of 13 000 tons, designed to ship frozen meat from Australia and New Zealand to the United Kingdom. During WW11 it was used in the war effort. 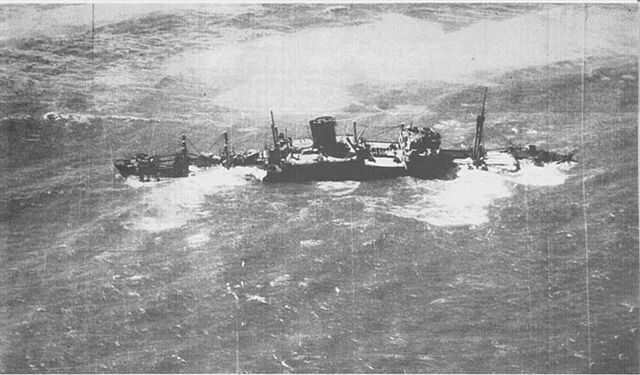 When it stranded on 29 November 1942, 40 km south of the Kunene River mouth she had 106 passengers and crew members on board. They managed to take 42 people to the shore while the rest were rescued from the ship by crew from the Norwegian cargo ship Temeraire. Various rescue attempts were undertaken. A Lockheed Ventura was sent from the Cape of Good Hope to land with supplies and water for the survivors who had made it to shore. It landed, but got stuck in loose sand when trying to take off. A second bomber was sent to replenish supplies. As it did not land, merely dropped its supplies, it had no problems at the site of the wreck but it crashed into the ocean on the way back. The three crewmen made it to shore and began their long walk south. A tug boat, the Sir Charles Elliott and two of its crew members were also lost just north of Rocky Point during the rescue attempt. 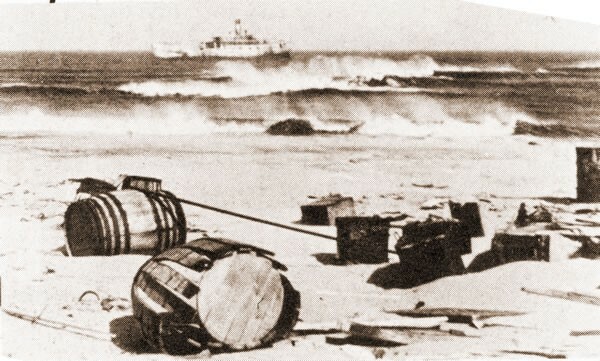 A land rescue convoy, led by Captain Smith of the South African Police, set out to reach those survivors who were ashore. The convoy reached the beach and rescued those survivors who had not been transferred by lifeboat to the Nerine, a converted minesweeper. Smith's 11 trucks got back to Windhoek on 23 December, where the survivors stayed before continuing overland by train. It took a month for the last of Dunedin Star‍ '​s crew to reach Cape Town, and more than two months for the last of the rescuers to return. 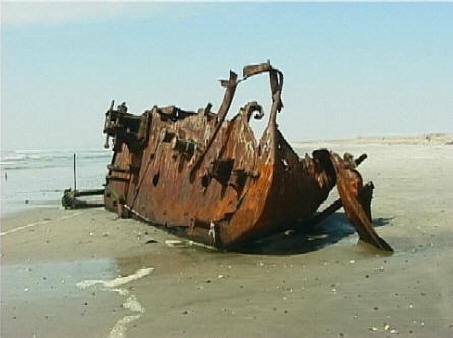 The Sir Charles Elliott was a South African steam tug that ran aground and was wrecked at Rock Point, Namibia on the 3rd December 1942. It was returning to Cape Town after assisting the DUNEDIN STAR. 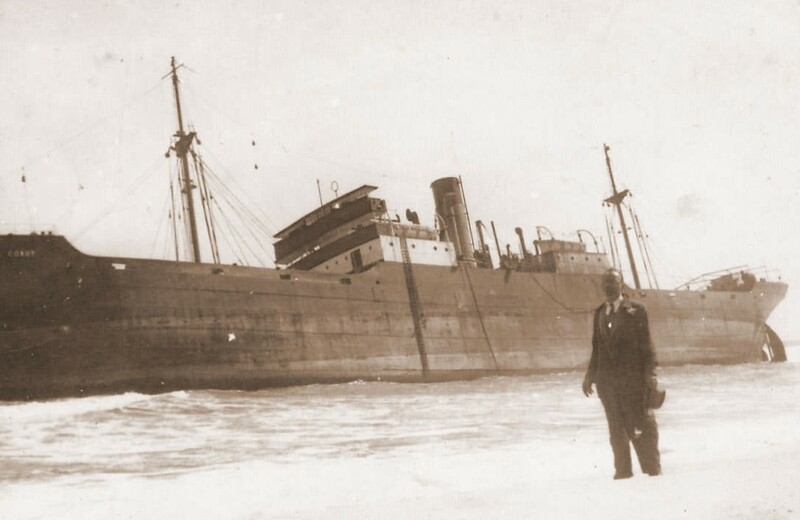 The Natal Coast, a WWI C-class standard cargo ship of over 3000 tons stranded in thick fog on 30 April 1955 approximately 30km north of Swakopmund. She was on her way from Matadi to Cape Town. She had a large consignment of coconuts on board, which was a delicacy at the time. A scrap dealer eventually dismantled her. Today only part of her engine room and boilers are visible at low tide. 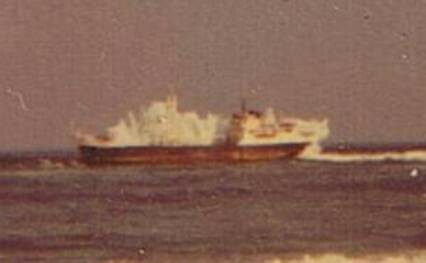 During thick mist the Iranian freighter Vipava, 630 tons, ran aground 16 miles north of Swakopmund under command of Captain Margaretic. The captain had to shut down the engines because the fuel was contaminated by sea water as she had punctured both fuel tanks. The Tug Otto Siedle arrived on the scene and tried to pull the freighter off the sandbank but the thick towing rope snapped and the crew, hungry and thirsty, decided to abandon the ship. This action most probably resulted in the total loss of the freighter, as nobody was available to affix further towropes. By Monday morning the hull had split open and water had seeped into her engine room. The vessel was carrying 220 tons of steel plates and 350 tons of paper. She was on her way to Khorramsharh in Iran. At low tide her engine blocks are visible from shore. The captain had to shut down the engines because the fuel was contaminated by sea water as both fuel tanks were punctured. The Tug Otto Siedle tried to pull the freighter off the sandbank but the tow rope broke. By Monday morning the hull had split open and water had seeped into her engine room. The ship was carrying 220 tons of steel plates and 350 tons of paper. The wreck was a landmark for many years just north of the Mile 14 campsite. Later years only the engine block was visible during low tide. 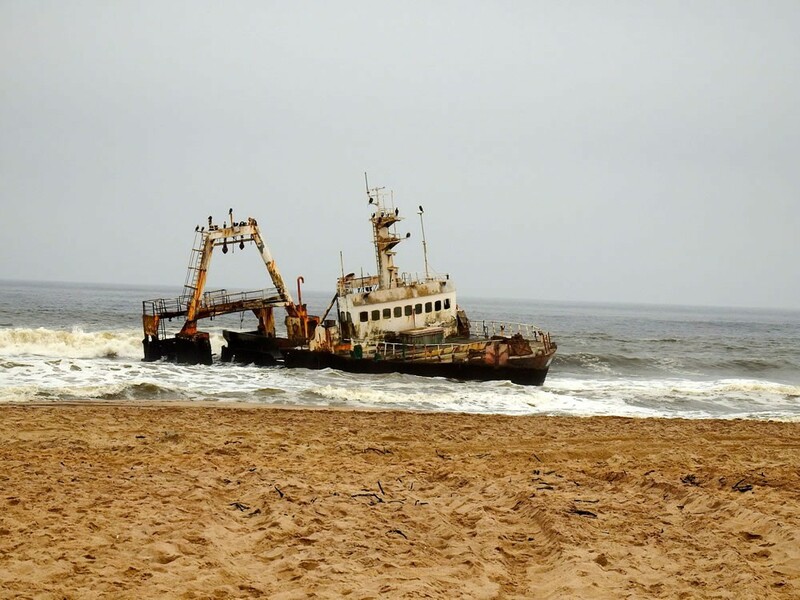 The Winston a South African wetfish trawler built in 1961 and owned by Agterbaai Trust in South Africa ran aground on 17 October 1970 about 23 km north of the Mile 108 campsite. The wreck of the Winston is one of the few wrecks still to be seen along the coast. The Suiderkus owned by the Angra Pequena Viskoporasie, Cape Town, was a modern fishing factory ship fitted with a highly sophisticated navigational system. Despite this the ship ran aground near Möwe Bay on 16 January 1977 on her maiden voyage. After a few months most of the ship had disintegrated but a large portion of the hull still survives. The Zeila stranded on 25 August 2008 in the early morning hours near "Die Walle", a popular fishing spot about 14km south of Henties Bay. 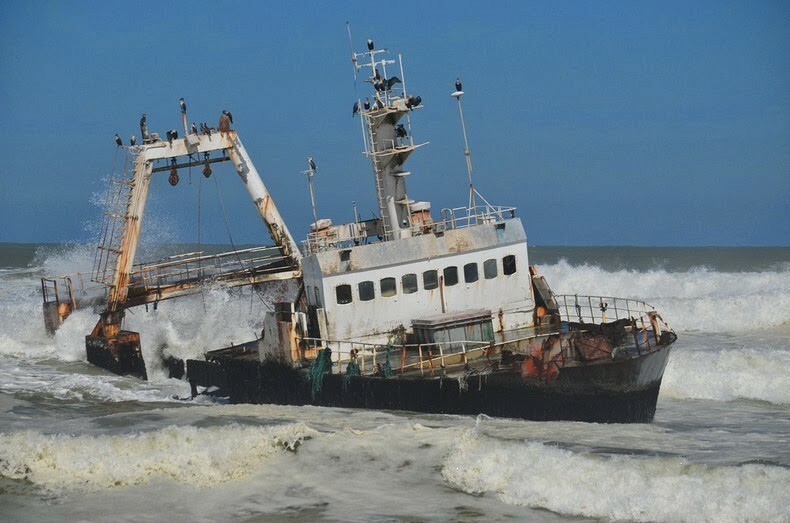 The fishing trawler that was sold as scrap metal to an Indian company by Hangana Fishing of Walvis Bay got stranded after it came loose from its towing line while on its way to Bombay, India shortly after it left Walvis Bay. After almost two years, international archaeologists and conservators have successfully salvaged the wreck believed to be of a 16th century Portuguese ship that lay undisturbed for 500 years off Namibia's Atlantic Coast near Oranjemund. The sunken ship's rich treasure includes a total of 2,266 gold and silver coins that were found underneath its planks. They largely consist of Portuguese and Spanish gold coins, and are presently in safe custody at the Bank of Namibia. 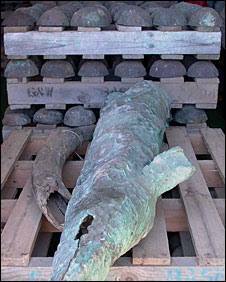 The shipwreck was discovered by a Namdeb worker, Kapaandu Shatika on April, 1, 2008. 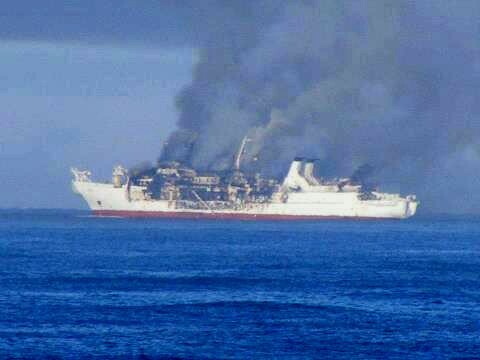 On 8 August 2012 fire broke out on board of the 135 meter long cable laying vessel Chamarel when the vessel was 68 miles north of Hentiesbay, Namibia. It was busy with laying cable from Cape Town to Europe. 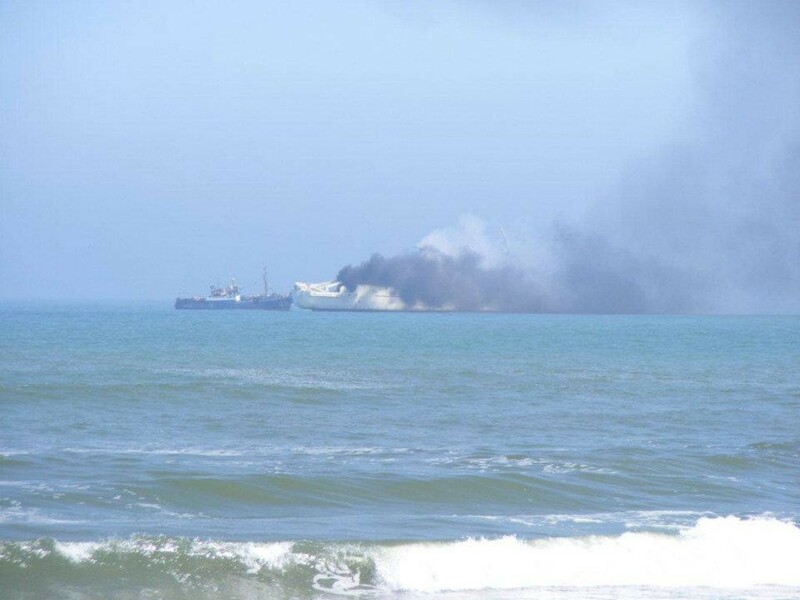 Initial reports indicated that a fire broke out on the bridge and then spread quickly to the rest of the vessel. The patrol boat Nataneul Maxwilili rescued the crew and took them to Walvis Bay. The crew consisted of 56 people. No one was injured. 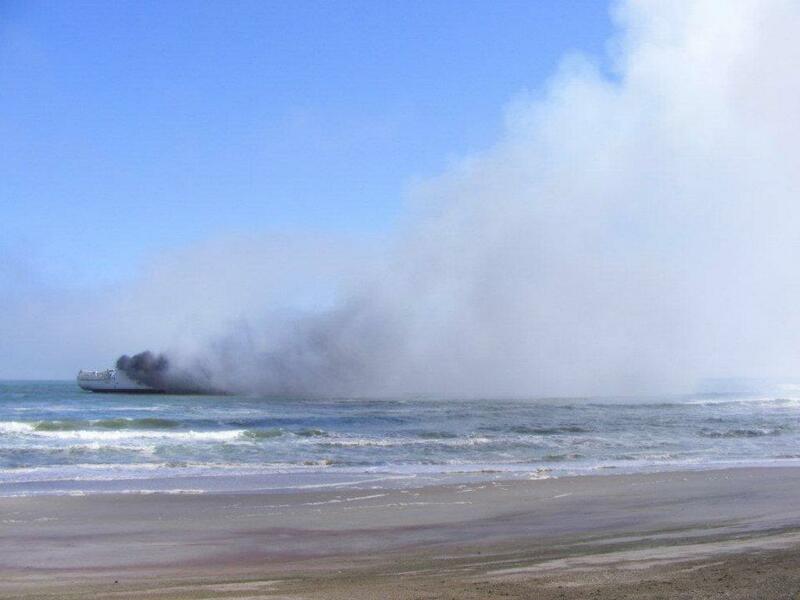 The abandoned vessel ran aground on a sand bank on August 9 around 14:30 and finally stranded on 10 August 2012 about 30km from Henties Bay still smouldering.